Is there a better alternative to Startup Chime Stopper? Is Startup Chime Stopper really the best app in System category? 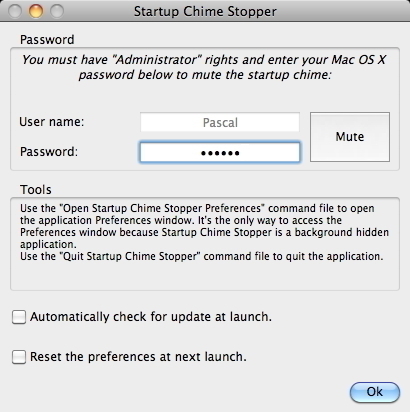 Will Startup Chime Stopper work good on macOS 10.13.4? Startup Chime Stopper is what you need if you are fed up with the irritating chime of your Macintosh at startup. You want to remove it? You want to start your Macintosh without noise? It removes the irritating chime of your Macintosh at startup. It is a background application that does not appear in the Dock. It is available in Dutch, English, French, German, Greek, Hungarian, Italian, Latvian, Norwegian, Portuguese, Russian, Spanish, Swedish, and many other languages. Under Mac OS 10.13 High Sierra, if you're launching the Application for the first time, maybe Mac OS X's GateKeeper (which you can configure in the "System Preferences") will refuse to launch it because you've not downloaded it from the Mac App Store (but from our website). In this case, instead of double-clicking on it, all you have to do is to right-click on the Application's icon, and then select the "Open" menu. A message will appear in which you'll be able to confirm that you want to launch the Application (even if it was not downloaded from the Mac App Store from an Identified Developer).